Nonprofit leaders and development professionals will be prepared to propel fundraising success as a result of the Donald A. Campbell Chair in Fundraising Leadership at the Indiana University Lilly Family School of Philanthropy at IUPUI. The new endowed chair will be created with a $1.5 million gift from Donald A. Campbell, Jr., CFRE, founder of Campbell & Company, a leading national fundraising, marketing and executive search firm that he guided to national prominence. During his 45 years of campaign and development experience, Campbell has personally been associated with campaigns and programs that have generated more than $3 billion in philanthropy. The chair holder will be a leading researcher and fundraising expert whose work will advance the knowledge and skills needed for fundraising and philanthropy professionals, executives and students to meet the challenges of bringing resources to the civic sector. The chair will conduct research, collaborate with The Fund Raising School at the school to incorporate recent research findings into its curriculum, and teach courses on raising funds from individuals and institutions such as foundations and corporations. The holder of the chair will interact closely with fundraising and nonprofit professionals to share research findings and to understand their professional concerns, which will inform future research. Through the school’s national and international network of scholars and professionals, the chair will enable more nonprofit leaders to become effective fundraisers while elevating the leadership readiness of fundraisers everywhere. The gift will be made from Campbell’s estate. 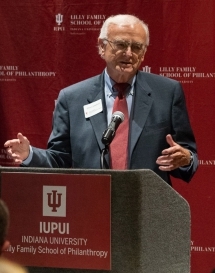 Campbell served as the organizing chair of the Board of Governors for the Center on Philanthropy at Indiana University, the predecessor of the Lilly Family School of Philanthropy. He was a member of the board for much of the organization’s history and he is a valued, long-standing advisor. The center presented him with its highest honor, the Henry A. Rosso Medal for Lifetime Achievement in Ethical Fund Raising, and has recognized him with IUPUI’s Spirit of Philanthropy award. A former two-term chairman of the national Association of Fundraising Professionals (AFP), Campbell was honored with its Founder’s Medallion for his many contributions to the association and the profession. AFP previously recognized him as its Outstanding Fund Raising Executive of the Year. He is a past president of AFP’s Chicago chapter and recipient of its first President’s Award for distinguished service to the fundraising profession. Campbell began his career as executive director of the Fenn College Alumni Association (now Cleveland State University) and served as development director of the American Heart Association in Cleveland, Ohio. He was a regional director of the University of Michigan’s $77 million campaign in 1964 and of Dartmouth College’s $55 million campaign in 1966. He served as capital fundraising manager for Case-Western Reserve University and as vice president of Charles R. Feldstein & Company in Chicago before starting Campbell & Company in 1976. Since retiring from active management of the firm in 2006, Campbell has continued his personal philanthropic engagement nationally and in the Chicago area. He currently is a member of the TKE Foundation’s executive committee and volunteers as an advisor to the University of Houston’s Conrad Hilton College of Hotel and Restaurant Management, Chicago Hope Academy, Chicago Maritime Society and a new Rock Steady program in Wilmette, Ill. He is a past chairman of numerous nonprofit boards and of the United Way of Chicago’s development committee. He received his B.B.A. in marketing from Fenn College. Campbell has sailed competitively for approximately 55 years, having raced the Chicago to Mackinac Race 30 times—winning his section three times--and earned Boat of the Year titles in Chicago several times.